anyways, it's the Easter Bunny kids! This link will show you what the animatronics should look like, but it's very basic. The story begins where this girl (but refers to herself as 'Mr. Fine', though we'll call her K) begins to work in the Pizzeria known as Freddy Fazbear's Pizzeria with her brother, William Afton. K heard that her brother wasn't doing so good in the Pizzeria that he worked in, which contained the Toys and Funtimes/SL mascots. She offered to take over in working in the new Pizzeria, and Afton agreed. She started working for many years. Soon the Pizzeria became unsafe for her, her brother, the animatronics (who became really close with her), the kids, and her assistant, Toby (who is a girl), so she lit the Pizzeria on fire. All the kids fled the establishment, leaving K, Afton, Toby, and the animatronics inside. 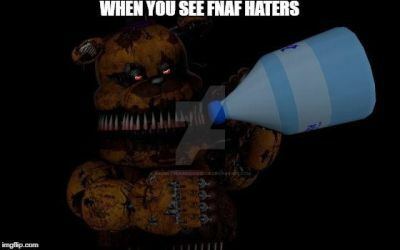 The only ones who survived were K, Afton, Toby, Golden Freddy, The Marionette, Lefty, and Mangle. They found all the burnt animatronics, but the one thing that survived are the memory chip. Toby, K, and Afton rebuilt the animatronics and Pizzeria. Funtime Chica, Music Man, Pluto, and the Mediocre Melodies are still the same, BB and JJ are Rockstars, and Kennith is now a FunTime. EDIT: I FORGOT TO MENTION some of the animatronics have different names now! The Fanchildren I created are now the PartyTime models. If you guys wanna join the AU, go right ahead! Just send me the link of your character. BTW Mr. Fine's real name is Krista/Kristian Afton. Also the reason why her other name is Dr. Fine is because she fixed the animatronics. My favorite FNaF ships are Molten Freddy x Lefty, Jack-O-Chica x N. Mangle, FT. Lolbica, and Golden Trap. Thanks for the watch!! Feel free to ask/dare any of the fnaf characters you please as long as you read the rules!! Hey, thanks for faving my dragon sculptures! I'm glad you like my work. Awwww thank you very much! Thank you very kindly for the watch. Please do stay an active watcher to see more of my art and do be as active as you can (you dont always have to be active, but is nice to get the odd fav or something every so often ^^). Also please don't just be watching me for a certain thing/fandom/type of artwork, I would like my watchers to be watching for everything I do, not just one thing, though if there is a certain thing I draw often you really like, that's ok and I'm glad ya like it. I do make contests and other announcements occationally too, so make sure you dont miss out on any announcements I may make if your into that sorta stuff (like contests, art raffles, excetera)! I very much apreciate if you can be active as often as you can (by this I mean don't watch me and then never pay attention to my account again, its annoying having people watching me for the sake of watching me and such, but I don't excpect you to be active all the time of course!!). Please don't just be watching me for the sake of watching me/wanting a watch back/because I watched you/excetera. Eeks Dee that's kinda it. Thank you so much for being alive and uhhhh knowing me.